"Where the history of heresy intersects with popular culture." 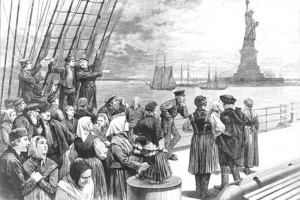 The history of American Immigration became increasingly centered on racial, national, and ethnic bias beginning around 1850. We are all complicit in this phenomenon since our economy and culture have been shaped based on racist and exclusionary immigration policies. That trend continues today. There is an alternative. Institionalize a guest worker program. Let everyone who comes here stay for 15 years as long as they stay off public assistance, avoid “crimes of moral turpitude” (as defined in American Immigration Law), get a job, and pay taxes. After that they can convert to Permanent Resident status, and then 5 years later apply for US Citizenship. Why not? Let’s let everyone come here and then let them decide their own fate. Besides, cheap labor is good for the American economy. Why can’t we out-compete the Chinese? Oh, yes we can. All we have to do is decide to do it. Here is a time-line outlining American immigration history. Heresy Detection Quiz: Are YOU a heretic? 1. Are you tired of people who use a Bible verse to settle every argument? 2. Are you sick of the pervasiveness of vampire culture? 3. Do you believe in angels AND demons? 4. Do you love a theological debate that is open-minded and accepting of alternative view-points? 5. Do you think that twelve-year-olds who believe that they can “study” to be a wizard are tiresome and naive? If you answered either “yes” or “no” to any of these questions, then you just might be….. a heretic! Our Darker Side … or Just Another Side? The "titles" for the Vangelis selections are based on my impressions of the pieces. "The Hermit" image is taken from the cover of the Jethro Tull album "Aqualung" (1971). the Source of True Light and Living Water.